In 2000, Pat Jervis, a high school teacher in Wise County, Va., received notice of the Kelly Branch Surface Mine permit in front of his mother’s home. He appealed to government agencies to challenge Meg Lynn Coal’s permit to mine and began meeting with other community members who were concerned about the impacts of surface mining. Although the mine’s permits were granted in 2000 and Kelly Branch moved forward, the citizens were still engaged in monitoring environmental threats. In 2007, this group became the Southern Appalachian Mountain Stewards, a nonprofit organization whose goals are to stop surface coal mining from destroying their neighborhoods, to improve the quality of life in the area and to help rebuild sustainable communities. 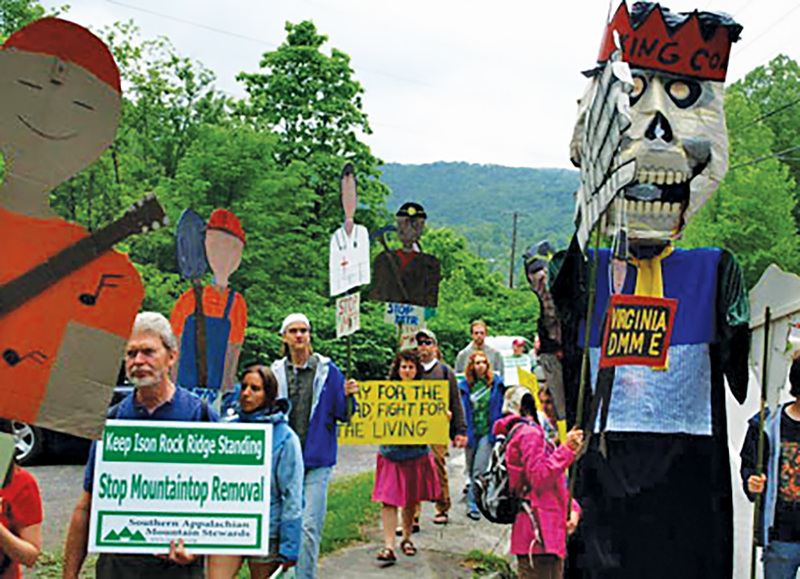 Southern Appalachian Mountain Stewards has utilized a variety of tactics, including community organizing, political advocacy, nonviolent direct action and alternative economic projects. This included SAMS members going door-to-door and sharing information with the community. 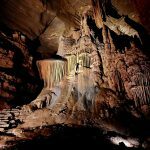 The community was already aware of the dangers associated with mining due to a local tragedy that occurred in 2004 at a mine owned by Jerry Wharton, who also owned the company behind the Kelly Branch Mine. Wise County has historically been dominated by coal mining. More than 30 peer-reviewed studies since 2010 show a connection between proximity to mountaintop removal operations and poor health outcomes, including higher rates of cancers, birth defects and heart, lung and kidney disease. Coal mining’s changes to the landscape have affected local residents environmentally, politically and economically. Many older SAMS members speak about how their home has changed. Larry Bush, a former union coal miner, describes a pond that used to be deep enough for baptisms. “Now it’s filled with silt — runoff from those mines — to where you just can’t. It’s just weeds growing across what was a ten foot deep pond,” he says. Residents describe other changes in their communities due to mountaintop removal such as the burying of streams and air contamination from coal dust. Private coal companies have also restricted access to areas where residents used to live, walk and hunt. SAMS members have challenged these and other factors since the organization’s inception. “The biggest victory that I can think of right off the top of my head, was saving a mountain!” says Jane Branham, former SAMS president. In 2007, A&G Coal Corporation — which by then operated the Kelly Branch Mine— proposed a 1,200-acre surface coal mine on Ison Rock Ridge in Wise County, Va. For eight years, SAMS members worked to stop the permit from being issued by organizing and participating in marches, hearings and campaigns and pursuing legal appeals in conjunction with other organizations. The state initially approved the permit in 2010, but the U.S. Environmental Protection Agency intervened to delay the process because of the company’s water quality violations and related problems at other mines. Members recall participating in monitoring local water quality, including at the Kelly Branch mine near Jervis’ mother’s home, and campaigning against coal dust while the permit was on hold. 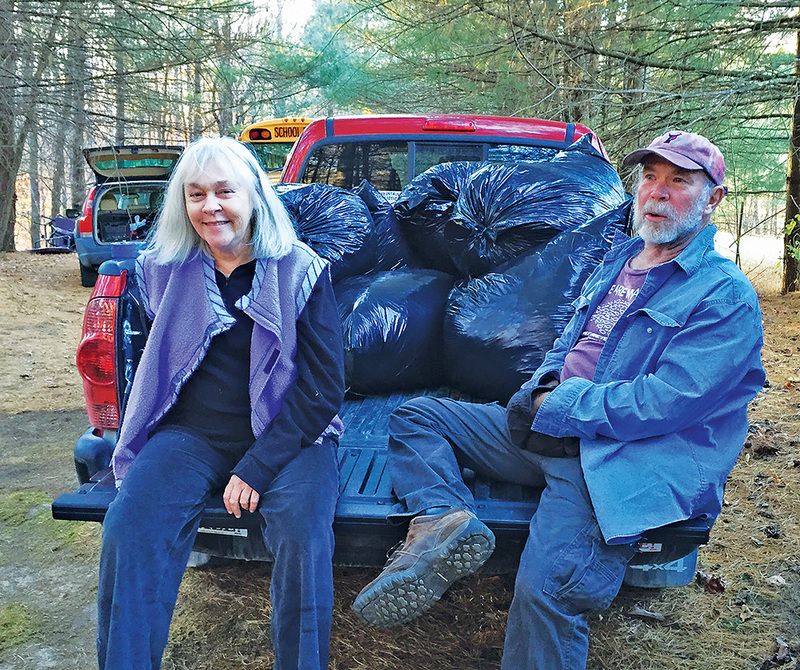 “Matt Hepler [was] our water organizer,” recalls Diana Withen, former SAMS vice president. “He [did] a lot of water testing, and he’s gotten several hits on selenium in the water, and where the coal companies are releasing more than the legal amount into the water.” These and other water pollution violations have led to court cases and settlements, totaling hundreds of thousands in fines. 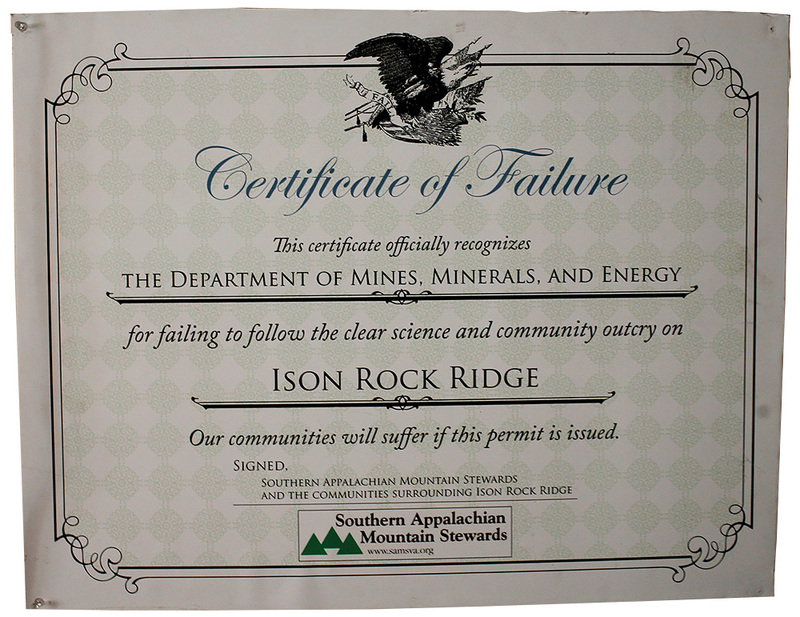 During the fight against the Ison Rock Ridge mine permit, SAMS members delivered this “Certificate of Failure,” above, to the Department of Mines, Minerals and Energy. A reprint now hangs proudly in the SAMS office. Photo by Hannah Gillespie. 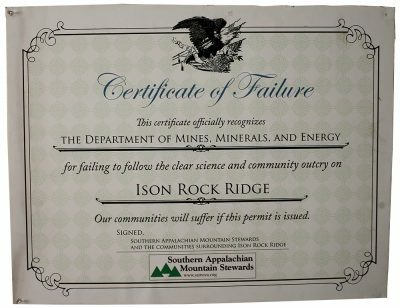 The Virginia Department of Mines, Minerals and Energy denied the Ison Rock Ridge permit application in 2013 after A&G failed to address the EPA’s concerns and keep their application current. A&G then started appealing that process and SAMS intervened. The process of appeals finally ended in a win for SAMS in 2015. 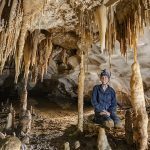 The victory is a source of pride for many SAMS members, though Ison Rock Ridge is not permanently protected. Since oil and gas company Penn Virginia Corporation owns the land, A&G or another mining company could lease the land and re-apply for the permit. Branham describes SAMS members knocking on doors and making phone calls to connect with others in the community. 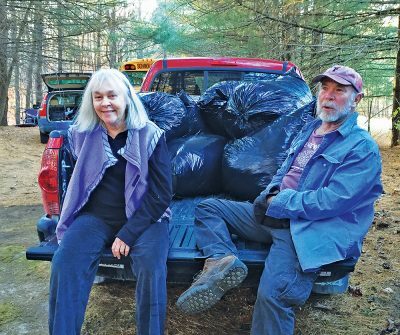 Even in an area “dominated by the mono-economy system here … almost everybody was like thank you, thank you for helping us, thank you for being our voice,” she says. After periods of internal division and moments of uncertainty regarding the livelihood of the organization, SAMS is currently in transition. According to Bill McCabe, as older members’ health worsens, the organization feels an urgency to re-engage past members and document its history before those stories are lost. The region is also changing, as the coal industry declines and some foundations shift their funding priorities. 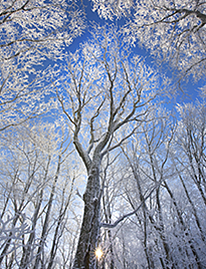 Although SAMS was established to combat mountaintop removal, the organization is now addressing other issues. “Social justice in general is something that we are looking at, with the environment being the number one priority,” says Terran Young, a SAMS board member who is also serving as a Highlander Transition Fellow with SAMS, the community and scholar organization Livelihoods Knowledge Exchange Network, and Appalachian Voices. In 2016, SAMS and partners reopened a 1979 study that explored Central Appalachian land ownership and taxation of companies that own mineral rights. With approximately 45 percent of the land in Wise County owned by corporate landholding entities, this study has local significance. Azariah Conerly, Ricki Draper and Christian Huerta contributed to this report. The authors are Appalachian State University students and members of the university’s Scholar Activist Alliance, a group that links academic institutions and frontline community organizations. They began interviewing current and former SAMS members in 2016 to document the organization’s history.